If you’re a regular reader of Paula’s Plate, you may recall my previous post for garlic herb bread. As I said, this is my favorite sandwich bread, as it adds an incredible amount of garlicky herby flavor to any plain-jane sandwich. 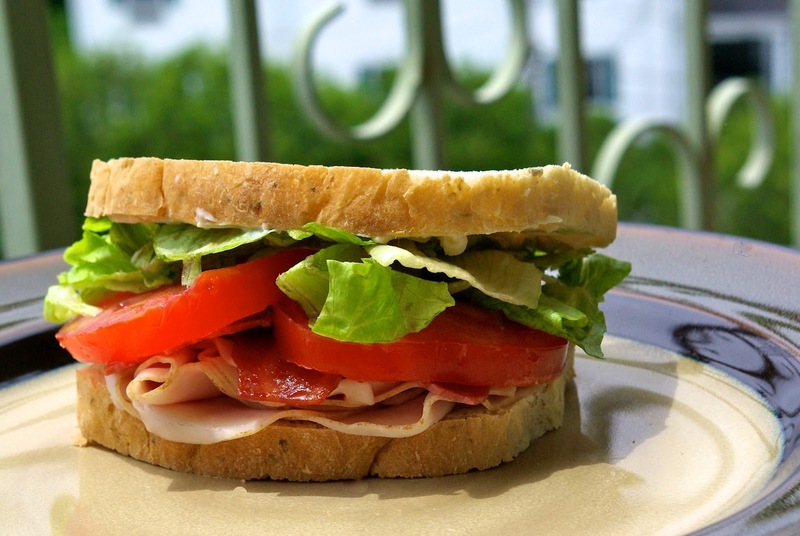 After making one of my favorite sandwiches for lunch yesterday, I had to snap a picture and share it with you. So easy, yet so very delicious, this Turkey Bacon Club makes a filling lunch or a refreshing, simple dinner on a busy weeknight. Now this isn’t some boring turkey sandwich. Oh no. This tasty treat is filled with smoked turkey, crispy turkey bacon, fresh green lettuce, juicy red tomatoes, and creamy smooth avocado. Shmear on a generous layer of garden vegetable cream cheese, and smoosh between two fresh slices of garlic herb bread and bam! Admittedly, this isn’t really a recipe, it’s more just a yummy combination of flavors, but I will list the ingredients below anyway. So quickly go make this sandwich, and then come back and read about the exciting new Kraft Delicious Bytes contest below; an easy entry with cash at stake? Yes please! Spread one ounce of Garden Vegetable Cream Cheese on each slice of toasted bread. 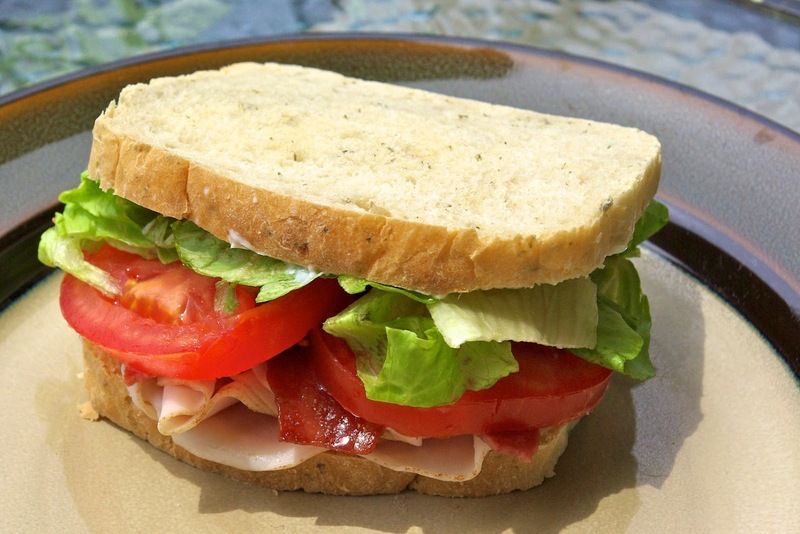 To build each sandwich, layer on one slice of bread: 1 crisp iceberg lettuce leaf, 4 thin tomato slices, 2 ounces of sliced deli turkey, 2 strips of cooked turkey bacon, and 1.5 ounces of sliced avocado. Repeat to make other sandwiches. Kraft Pin and Win Sweepstakes! 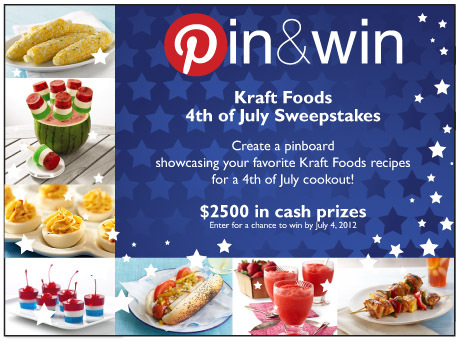 Well, Kraft has also joined the world of Pintrest, (you can follow them at pinterest.com/kraftrecipes) and they have a fun new contest going on right now called the “Pin and Win” sweepstakes, which ends July 4th. What is this awesome contest? Let me tell you! With the 4th of July speedily approaching, Kraft wants to know what YOU would make for your Ultimate 4th of July Cookout. All you have to do is follow four easy steps, and you have a chance of winning some serious cash prizes! Score! 1. Go to pinterest.com/kraftrecipes and follow Kraft. 3. Pin 10 or more of your favorite summer recipes, from kraftrecipes.com OR pinterest.com/kraftrecipes. Include #kraftrecipes in the description of each pin. kraftapps.com for a chance to win one of ten $200 American Express gift card first prizes OR the grand prize of a $500 American Express gift card. It’s as easy as that! I’ve got my pin board started, have you? Are you pin crazy? What do you search for when you’re busy pinning? Let me know below! Now that is a sandwich! You can't beat homemade bread!